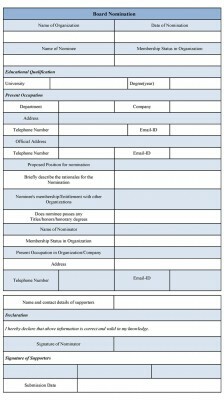 A Board nomination form is performed by a company for selecting the board member or executing a specific purpose. Such type of form follows a certain guidelines as per the company’s policy and this form species the name or names of the nomination. Many schools and organizations also maintain a pta nomination form for conducting the purpose. Generally, the board member decides the format of the form. The candidate is selected among the nominees through the election process. 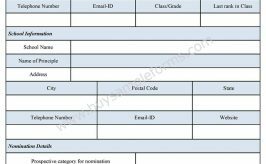 A nomination form template mentions the information regarding the name of the organization and the nominees and the other details, includes occupation, professional experience and so on. The form must carry a declaration statement that should be acknowledged by the concerned person. Signature of the board member is required to complete the process. 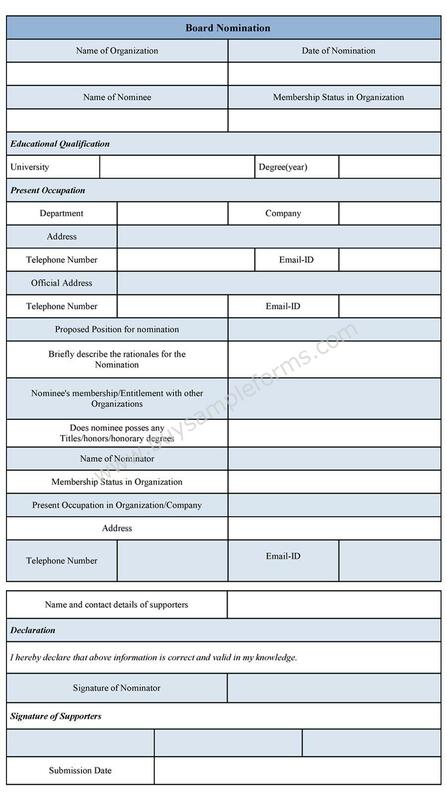 The sample of the form can be downloaded in both PDF and word file as per the needs. You can make necessary changes on the form too.